Mining giant Anglo American is facing a crisis of confidence. It unveiled what it called a “radical” restructuring on Dec. 8, designed to meet the dangers posed by the rout in commodities prices. More than a quarter of the workforce is to go. Investment spending is being slashed. The dividend is ditched. The boom years of the commodities super-cycle, when mining companies listed in London offered high-growth returns linked to China’s rapidly expanding economy, are well and truly finished. The dividend-rich security that attracted investors to the mining sector is also a thing of the past. This year, as the rosy super-cycle assumptions have been shattered, the seven big mining groups listed on the FTSE 100 index have lost 47 percent of their market value. Aggregate dividend payouts for the sector are expected to fall by 34 percent, according to the broker AJ Bell. It reckons that mining companies will contribute just 5.7 percent of FTSE 100 dividend payouts in 2016. In 2014 it was 9.1 percent. But even as miners such as Anglo take “radical” action, their key task to explain how they will cope with the dark side of the commodity super-cycle remains. For just as things were stronger for longer, they may now be weaker for ages. The down leg may be worse, moreover, because mining companies tried to deal with falling prices by ramping up production. In the upswing years, miners loaded up with debt to fund new projects that would meet future demand for raw materials. In the down years, the borrowings will gnaw at investors’ nerves. Anglo is not the only big London-listed miner struggling. Glencore has frozen its dividend in order to conserve cash while BHP and Rio are hardly in rude health. Anglo will restructure into three divisions focused on key areas including copper, iron ore and industrial metals. That might help. But since the commodity-price pressure is obvious, and the dividend cut widely anticipated, it is telling that shares in Anglo fell a thumping 11 percent on Tuesday. If the road to recovery for Anglo starts here, investors are yet to get on board. 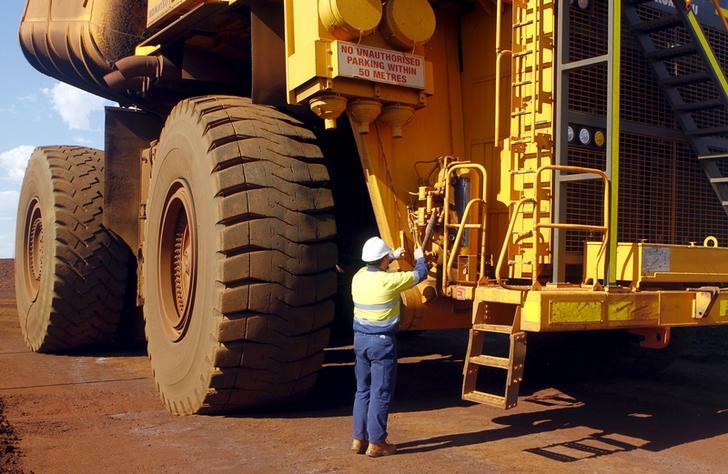 A worker checks a truck loaded with iron ore.
Anglo American said on Dec. 8 that it would suspend its dividends and cut its workforce to 50,000 employees from 135,000 in a restructuring plan that the company described as “radical”. The cuts come in response to a rout in commodities prices. The FTSE All-Share Mining Index has lost 47 percent of its value in the current year.